Guamà is a municipality in the southern Cuban province of Santiago de Cuba, and Guamà II is a suburb within the municipality. For some 18 years now a team of lay missionaries have been travelling, Sunday after Sunday, into the remote villages of this Guamà II pastoral district to bring the Gospel message of Christ to the people. Sitting in the back of a borrowed truck, they travel for hours on end in all weathers, sometimes up to 150 km (95 miles) on bumpy and dangerous coastal roads, overhung by rocky outcrops. There is no question of comfort, and they even bring their own food and bedding, since the people they are visiting are extremely poor. This selfless commitment by these lay missionaries is a response to the acute shortage of priests in the region. Fundamentalist sects are spreading further and further and trying to woo away the Catholics from their faith. If the Church cannot be visibly present, it is often too late. And yet the people are very open to religious faith. 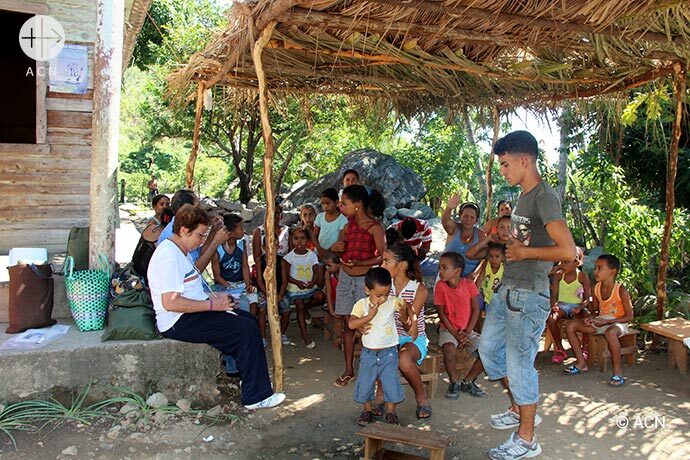 Sister María Asunción Domínguez Castañeda, who belongs to the congregation on the Catechetical Sisters of Dolores Sopeña, and who runs the programme, writes: "The people are thirsting for God, and this is our way of coming to them as Church. Many people who have had never had any contact with the Church are now asking to receive the sacraments." A priest also accompanies these lay missionaries as often as possible, administering the sacraments to those who seek them. The sisters‘ work includes training these lay missionaries in one-week intensive courses and additional monthly courses. Once they have completed their training, the missionaries act as community leaders, conducting Liturgies of the Word, helping distribute Holy Communion and giving catechetical instruction. They include people of all ages, and even several young people. "The Catholic faithful in the communities really appreciate the involvement of these young people", Sister Maria Asunciòn remarks. "I believe that what we are able to do at this time for Cuba is really worth the effort", she adds. ACN has provided AUD $19,000 for the support of this programme. Our heartfelt thanks to all who have contributed!